Nearly five years ago, writer Naomi Shulman wrote “Requiem for a Minivan” for the New York Times about the relationship that had developed between the members of her family and their family vehicle. In her essay, she honors the functionality and utility of their minivan in Erma Bombeck-esque style, running through the memories her kids had created with her and her husband. The minivan, she wrote, was a “submission” into parenthood. She tapped the mat, giving up the match; submitting to a minivan sounded mournful until she realized how useful her minivan was to her. And I admit, I had a similar feeling about minivans. As an automobile fanatic, and one who historically prefers fast cars and big trucks to small cars and vans, it didn’t excite me. We had a few vans when I was a kid, plus a station wagon, and although the memories of that time period were good, there was no love in my heart for the vehicles themselves. It was my nine-year-old son, accompanying me to a local auto show, who turned my head toward the possibilities. “No, kiddo, Dad’s not going for a minivan,” I said, thinking. And neither am I. But then I started to reevaluate. Road trip… arewethereyetmom… lots of room… hmm. And a friend at the Fiat Chrysler group helped me get a loaner for a big surprise trip I was planning to Disney World for our son’s first visit to the most magical place on earth. 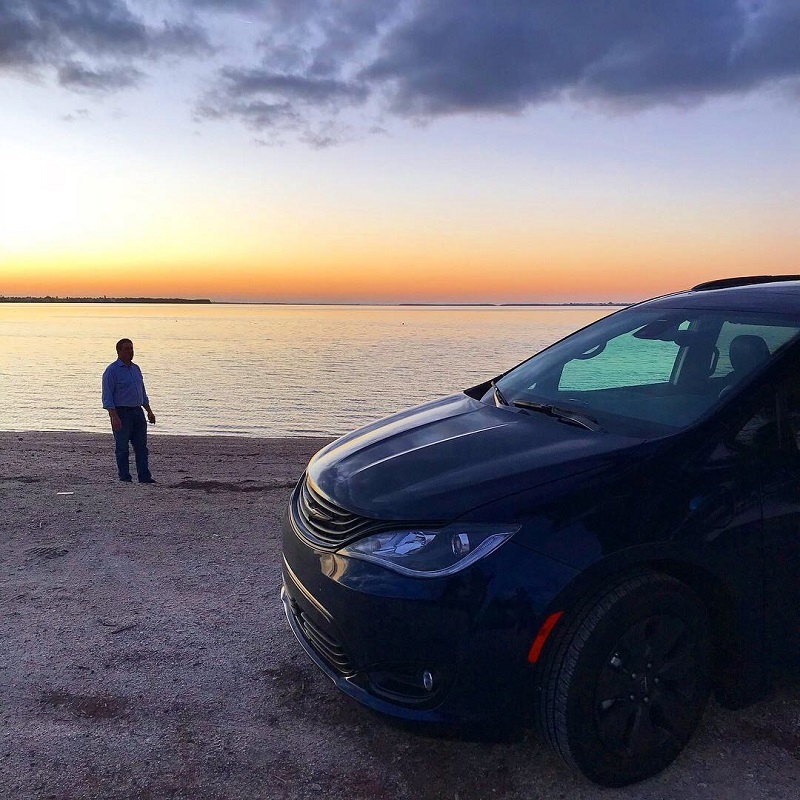 Mid-December, a brand-new Chrysler Pacifica Hybrid rolled in all the way from Motor City, where it was born. Taking the key fob in my hand, I pressed a button and the door opened, magically. My son climbed into the middle row and paused, incredulous. “YES!” he fist-pumped to the screen in front of him. So much for my attempts to minimize the glory of electronics. Merrily, merrily, merrily we took to Interstate I-10 across Texas, Louisiana, Mississippi, and Alabama. On day two, we awoke in Dothan, Alabama, just north of the Florida border, and set up the iPhone for a video reveal. I waited with excitement for the squeal that would surely follow. “OK,” he said, with a shrug. I had planned out this trip for months, setting up hotels and tickets and Fast Passes so that we could have a family vacation for the first time in a long time. And all he wanted was to hang out in the van. It was just like when he was a toddler and we got him a cool toy and all he wanted to play with was the box. He was happy in the van and didn’t really care where we were going. The good news is that at least we’re not high maintenance up in here. We made it to Orlando, checked into the Wyndham Lake Buena Vista (which we loved! ), and unloaded our minivan with everything we had brought with us. (Thank heaven for luggage carts.) We spent a total of 13 hours at Disney World the next day, and aside from a transportation snafu that my husband experienced trying to get back to the hotel to take a nap mid-day, everything was spectacular. We didn’t even mind waiting 90 minutes for my son’s first roller coaster ride… and the smile on his face at the end and “that was SO COOL, Mom” made it all worthwhile. Here’s what surprised me, though: the best part of our trip wasn’t about the roller coasters. 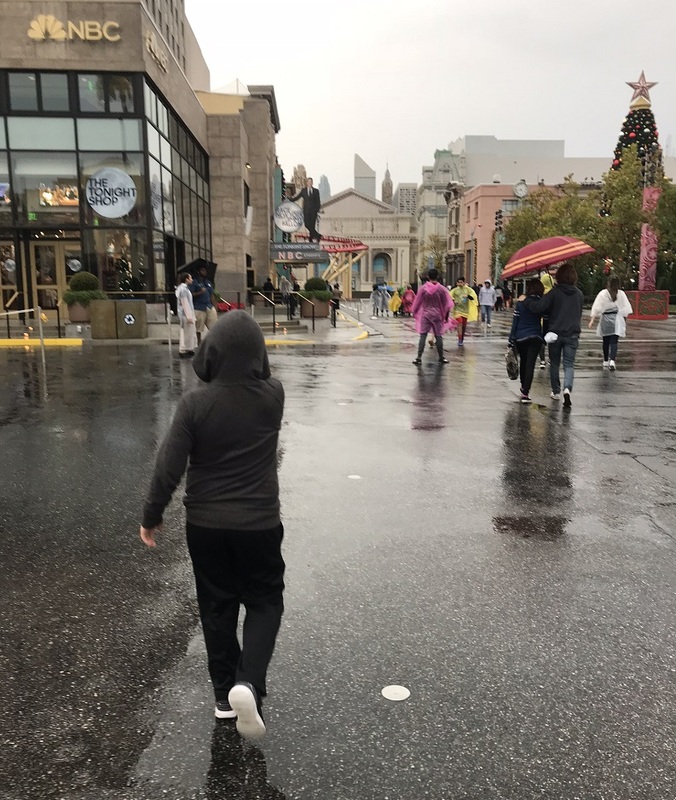 When it was all said and done, both Disney World and our subsequent trip to Universal Studios and the Wizarding World of Harry Potter were spectacularly fun for our family. But what I remember most was the time we spent together, just the three of us. We weren’t texting, posting, tweeting, scrolling, or watching anything. No working, running errands, or doing homework. No email. No early bedtimes. Instead, we laughed at the silliest things and counted license plates from nearly every state in the country on the road. We picked up our lunch in the food court at our hotel at Universal and watched commercials from the 60s. We slept in and tossed basketballs at the arcade. And we talked and listened to each other. This is what he’s going to remember in the rear view mirror of his memories. Of course, he’s not going to forget the magical time we went to visit Mickey Mouse and Harry Potter. When he looks back later in life, though, I bet what he remembers is the trip itself. When we turned the minivan back in when we returned home, my son paused for a moment and put his hand on the hood. Now I get it, Naomi Shulman. Your ode to your minivan wasn’t about the vehicle. It was about the time you spent in it, making memories. You can also find this post on the TODAY show Parenting Team page!